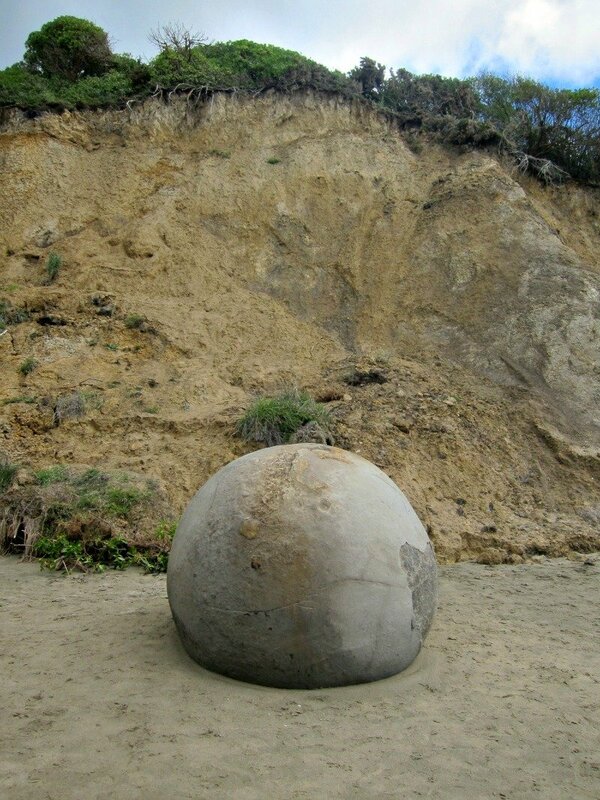 If painted orange, the Moeraki boulders with their their hard calcite exteriors and muddy centres, could easily be mistaken for huge Jaffas (although definitely too large for rolling down the aisle at movies). On a previous visit I watched amazed, as a Korean tourist, dressed in stylish slacks rolled shin high, long sleeved shirt and jacket, jump from a boulder, only to sink thigh high in the freezing water. Laughing, he shook his fist in the air striking a triumphant pose. There are deceptively deep holes immediately surrounding the boulders. Children love the chance to jump on the mini boulders and shout – Ship Ahoy! Pack Wellies for the kids. Photographers with tripods set wait for something – most likely tide related – to gain the perfect shot of the spherical boulders. Moeraki is a Family Friendly destination. Other Things to do nearby. 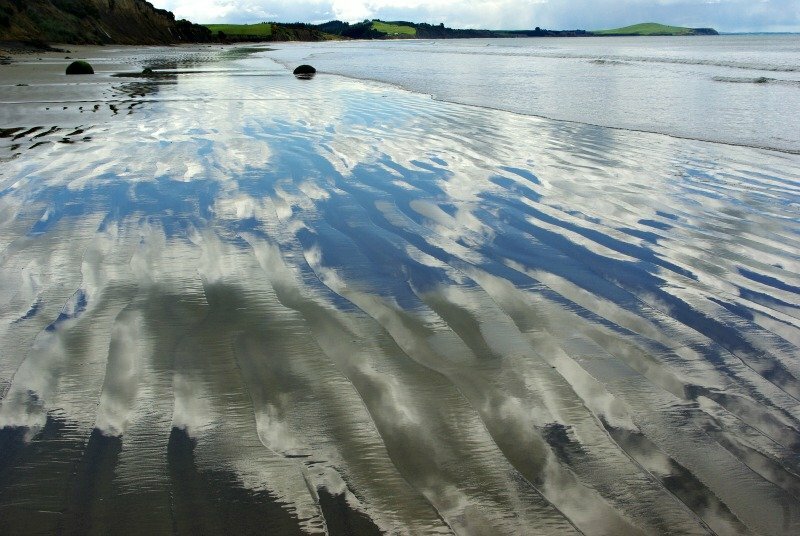 They are along a stretch of Koekohe Beach, near the town of Moeraki, New Zealand. The town of Moeraki is 45 minutes north of Dunedin and 20 minutes south of Oamaru in Otago in the South Island. 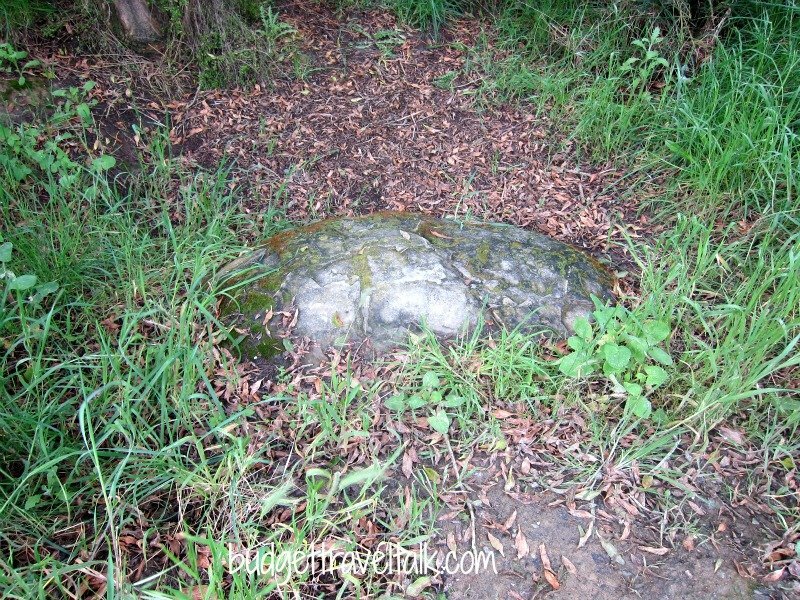 There are similar boulders in other areas of New Zealand and the World, but the ones at here, ranging from .5 of a metre to 3 metres in diameter and weighing up to a whopping 7 tonne, are well known and very popular. There are scientific explanations about ocean sediments 60 million years ago that formed these Concretions, but Maori Culture weaves a story portraying them as eel baskets washed ashore from a legendary canoe, the Araiteuru, wrecked at nearby Shag Point (Matakaea). The boulders lie secreted in the shoreline, like baby teeth, biding their time, waiting for the ocean to wash them from their hiding holes in the coastal cliff and roll them like giant marbles onto the beach. Every cloud has a silver lining and New Zealand’s South Island hosts plenty of cloudy days. They are perfect for capturing boulder pictures and reflections in the muddy sand. Arrive before low tide to set up. 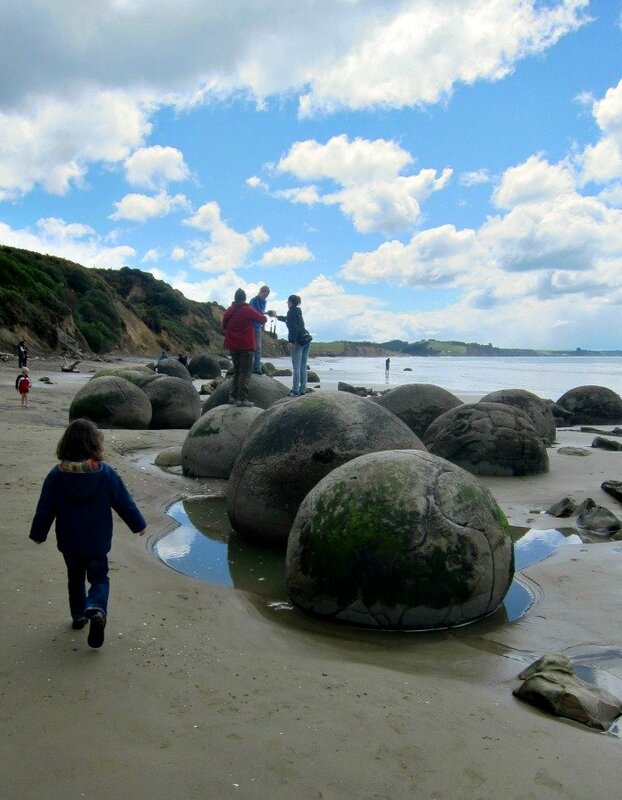 A visit to Koehohe or Moeraki Beach is suitable for the whole family. 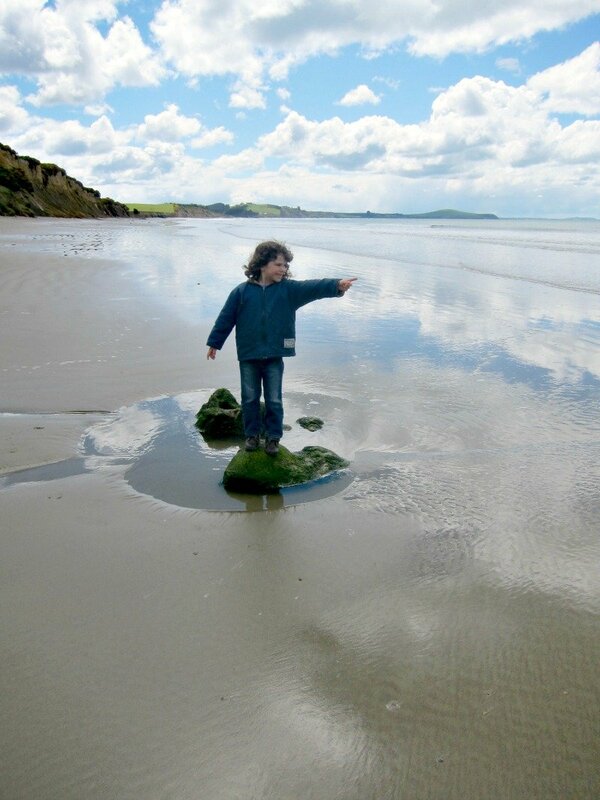 Children look for wet and wild adventures, without wondering at the process that started millions of years ago. Ancient sea floor sediments were the conception point for the boulders so magically delivered to the shoreline today. Up above lies Morekai Boulders Cafe – the perfect place for anyone who would rather view the beach from above. They also have a well stocked gift shop to while away some time in. The Cafe has a range of Starters, Main Meals and Burgers, with an emphasis on seafood, with one vegan (pumpkin and Kumara soup) and lots of Gluten Free options. Patrons can access the beach from the cafe. A small donation is requested, presumably for upkeep of the track. It can also be reached from the public carpark at the Moeraki township end of the beach. There had been rain prior to our last visit and a small creek was running, making access a little difficult. I do suggest trying this option anyway as it has worked well for us previously. Unless you have studied the tides and arrive exactly to plan (low tide is best) you may need to spend some time on the beach so it’s best to be prepared. Visit the cute little town of Moeraki. It is only 7km by road from the boulders. 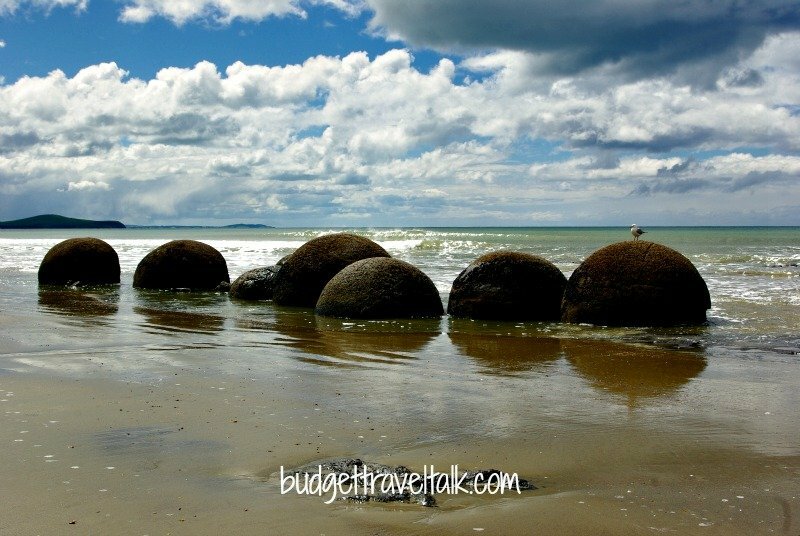 If you look out across the bay to the south when at the boulders you will see Moeraki on the peninsula. Have lunch and a beer at the Moeraki Tavern (a typical Kiwi style pub). I recommend their great tasting full-size seafood chowder and there is a cosy fireplace for winter or a great deck for summer outside. Or eat at Fleurs Place, a more upmarket restaurant with a good following – it wasn’t open during our visit. Drive to the lighthouse to see yellow eyed penguins, seals and wild rabbits. 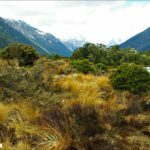 Coastal walk from Moeraki to Hampden – a distance of a little over 8 km. 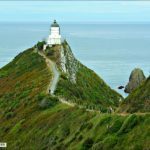 Take the Millennium Track from Moeraki township to Moeraki Boulders and continue at low tide, along the beach to Hampden. Camping and Caravanning at Moeraki Village Holiday Park. 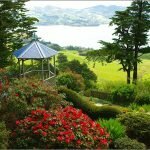 It has great views of the Bay and you can walk to the Moeraki Tavern. Airbnb have 28 places available in Moeraki. Remember you can use the Airbnb link in our sidebar to receive a great discount as a first time user. 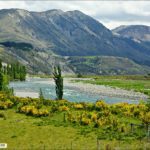 Gumtree Farm Stay near Oamaru is a working sheep farm and a wonderful place to experience genuine Kiwi farm life. It also can be booked through Airbnb. At home on the Sunshine Coast of Queensland I walk along the beach every night, scanning the coastal cliffs looking for signs of boulders waiting to be born. I guess there were different sediments at work millions of years ago in our part of the world. 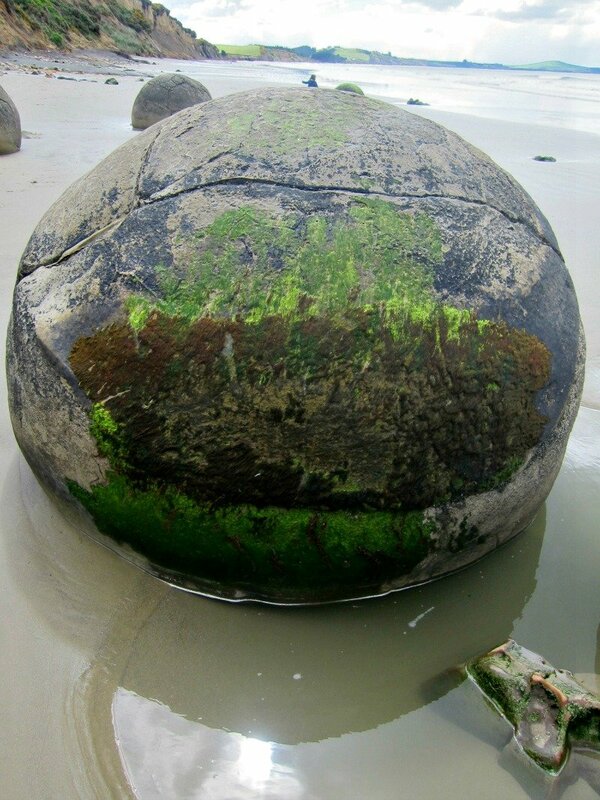 Have you seen spherical boulders on the beach before? If so where? 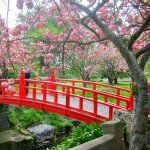 This post is linked to Travel Photo Thursday at Budget Travelers Sandbox, where there are always interesting travel photos from across the world to be found. I would have been very tempted to jump from boulder to boulder too! It’s fascinating to know how they are formed. We sometimes forget how strong nature is to be able to move the boulders closer towards the sea! These are amazing! They look so magical and it’s no surprise why they draw such a crowd especially the kids. Beautiful shots! It is a wonderful place. This time around the new boulder had been born, so that was exciting. It was the second time we have been there. It was just as good the second time – actually it was a better time of the tide this time. Thanks for commenting. Great photos and what a wonderful subject! 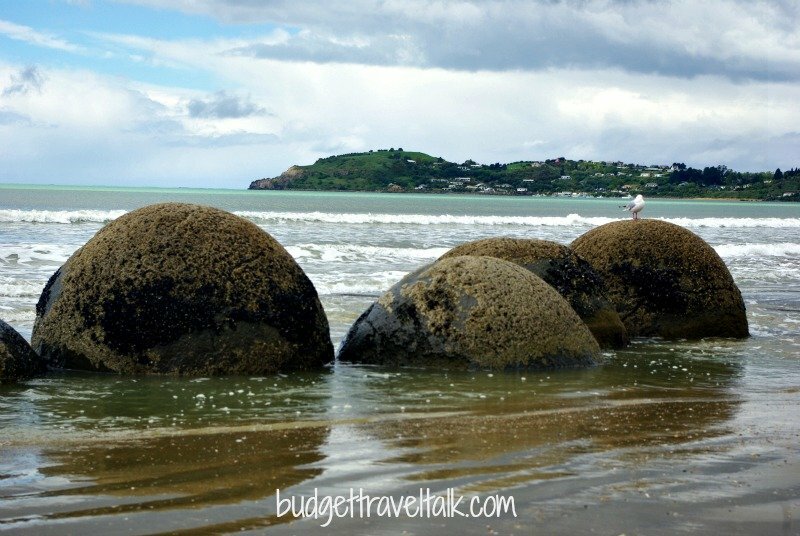 Big Balls of Mud – Moeraki Style – http://t.co/WdQnB7OQ http://t.co/WdQnB7OQ What a stunning beach! 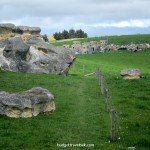 I never did see these boulders on my trip to NZ – but sorry to have missed them. I love your close-up shot. I love these boulders! They’re so perfectly formed. We have boulders here in a local river, the Wag Water. I doubt we have as interesting an explanation for their existence though. I’ve also seen boulders at Boulders Beach in Cape Town. What an interesting phenomenon, like nature’s playground. We missed this when we lived in New Zealand, really time to go back. Love your reflection-photo. I lost a pair of shoes when I visited the boulders….I totally misjudged the waves and ended up soaked from the knees down! That is so funny. Hope you enjoyed it! I have never heard of Jaffa, but it sounds tasty. Those boulders are so interesting. I can definitely see my kids jumping on them. The reflection photo is stunning. Love the light and movement in that photo! I must admit I love that photo too. Thanks Jade. Those big boulders look freaky, why did he try to jump them? Okay so I’ve been to NZ 4 or 5 times but have never seen or even heard of these! They look so cool! They are totally cool. I check them out whenever we go to the South Island. It helps of course that my friend runs an Airbnb Farmstay at Oamaru which is just 20 minutes up the road, so I’m in the neighbourhood. The pub at Moeraki is great and the town itself a lovely little (very little) seaside town.